Transform your car into a Space Cruiser! This accordion style sunshade from Rick And Morty protects, cools, blocks out UV rays and keeps your interior from cracking and fading. 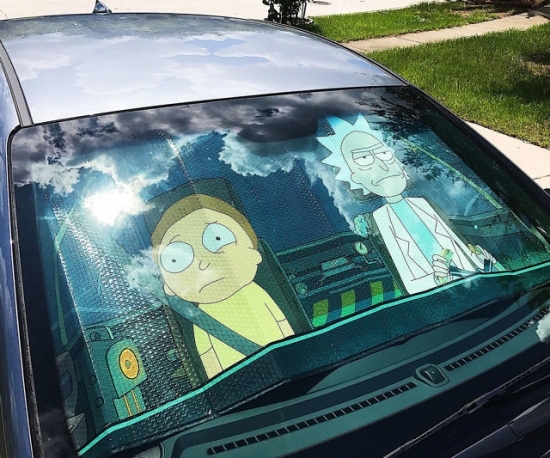 Now you can keep your car cool with this Rick and Morty car sun shade. The sunshade shows Rick and Morty in a space cruiser. This foldable car sunshade is great at blocking the sun and heat so that your car will stay cooler while parked. If you like Rick and Morty and don’t like hot cars then you just need to own this shade.